A showstopping pork dish that’s a great Sunday lunch for a crowd, the trim from the rack makes a flavourful stuffing, infused with wild garlic or use a combination of spinach and garlic. 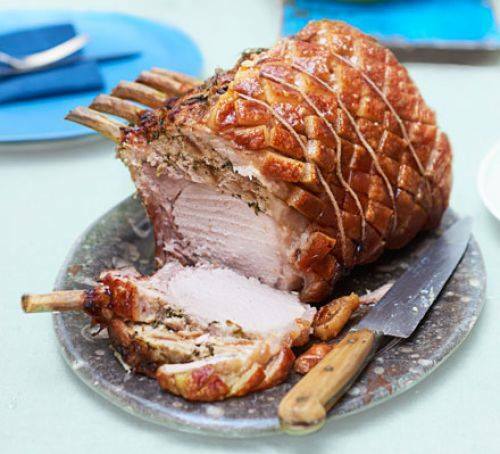 In the morning before you cook the pork, use a very sharp knife (or ask the butcher) to cut a deep flap under the skin and fat of the meat, all the way along the rack – be sure to leave at least 5cm connected. Rub the powdered sea salt all over the flesh (not the skin), then leave uncovered in the fridge for at least 2 hrs. Take out of the fridge 30 mins before you want to cook it, to come to room temperature. Heat oven to 240C/220C fan/gas 9. Meanwhile, make the stuffing. Heat the olive oil in a frying pan. Add the onion, a pinch of sea salt and black pepper, and the thyme leaves. Cook over a low heat, stirring until the onion has softened, about 10 mins. Add the sourdough 2 mins before the end. Remove from the heat and transfer the mix to a bowl. In a dry frying pan, toast the fennel and coriander seeds and chilli flakes over a high heat for 1-2 mins. Allow to cool, then use a pestle and mortar to grind with a pinch of sea salt. Add the ground spices to the onion mixture and mix with the pork trim. Season again, grate in some nutmeg to taste and add the lemon zest, parsley and wild garlic. Mix everything together with your hands to thoroughly combine, then add the egg and mix again. Press the stuffing into the flap in the pork and tie up with string all the way along to hold the stuffing in. Use foil to cover any exposed stuffing, as it will burn in the hot oven. Place the joint on a baking tray. Cook the pork for 20 mins per 450g – so 2 hrs 20 mins for a joint this size. Start it off on 240C/220C fan/gas 9 for 20 mins, then reduce the heat to 200C/180C fan/gas 6 and cook for 2 hrs. Turn it halfway through to ensure it’s cooking evenly and test it 10 mins before the end with a temperature probe. When the core reads 70C, it’s cooked. Wrap the pork in foil and leave to rest while you prepare your side dishes.